Hakuna Matata, it means no worries! – If you ask, it’s not an artificial phrase made exclusively for Walt Disney’s Lion King blockbuster, it’s a real sentence in Swahili, the official language of Kenya, and it does mean ‘no worries’. Hakuna Matata, yes, in Kenya that’s the way of life, just take it easy, relax and enjoy! I already attempted to go to Kenya in 2008 when I applied for an internship with AIESEC in Kenya but didn’t succeed. And then, when I was in London I asked myself, why not now? And there I went, it took me 10 minutes to book the tickets. Nothing is more fun than deciding a trip out of the blue, especially when it is a place you already dreamed of a long time ago. And again, Kenya for me was not about the safari or the wild animals, it was about the people and the life that should have been mine long time ago. I spent roughly 2 weeks in Kenya from the 10th to 25th September 2016. I flew to Nairobi from London with Turkish Airlines for an amazing return airfares of less than £350 ($440). Of course there’s additional price to pay, or two. After a transit at the super duper crowded transit terminal of Istanbul’s Ataturk, I arrived at Nairobi’s Jomo Kenyatta Airport at 2.30 in the morning and 2 weeks later left on a 5 am flight. If you travel from Vietnam, there’s a direct flight with Kenya Airways. Keep an eye on their occasional promotions! Another friend of mine got a deal of $720 direct from Hanoi to Nairobi a few months earlier and she booked only 2 months in advance. Visa is easy, you can get e-visa in advance, but I encountered no problem with visa upon arrival. I downloaded the form here, filled it in, and it took no more than 15 minutes to get the visa at the airport. Alright, arriving at 2.30 am does have some advantage, almost no one was queuing. The fee for a single entry visa was $50 (or £30). You can also get the East Africa visa for $100 for three countries Kenya, Tanzania and Uganda. – Certificate of yellow fever vaccination: this is compulsory for travellers to Kenya. I was told by an Australian friend that his friend got stopped at the airport for not being able to present this certificate. The travel advice by UK Government also says this certificate is required. At first I thought it was just another overcautious reaction by the UK or Australia and if we fly from Vietnam this paper wouldn’t be necessary (hey, we Vietnamese have to take the Tuberculosis test in order to get the UK visa as if TB were epidemic over here). However, during my journey I realized that the certificate was actually required. My German travelmate said his certificate was checked at the Tanzania-Kenya border. So well, I guess you’d better get it before going, not worth risking. This yellow fever shot cost me £70 at London Travel Clinic. – Mosquito spray, the strongest type! Believe me, the Kenyan mosquitoes are vicious! If there was a reason why I felt not welcomed in Kenya, it’s the mosquitoes! They bit me like a piece of walking meat! My whole body was swollen and everyone was so scared that I would catch malaria. Of course I blame my “sweet blood”, but still, you wouldn’t want them to ruin your time in Kenya. – Malaria pills (sorry I forgot the name): the London clinic advised me to get these from Tesco Extra or Boost, but guess what? As usual, I waited till my last day before departure for preparation and they didn’t have the medicine available – but hey why would I bother, I come from Vietnam right?! However, I was actually quite scared when getting those heavy mosquito bites. Even though I didn’t catch malaria (thanks God!) it is learned that I should listen to doctor’s medical advice next time. Don’t be like me. – A scarf (to cover your nose) or face mask: the route to Maasai Mara is dusty, super dusty. You’ll be covered in dust and breathing all the dust – obviously not good news for whomever that has to suffer from dust allergy. Kenya is situated in East Africa, with roughly 600 km of coastline on Indian Ocean. The weather is dry and generally mild throughout the year (this reminds me of a Ugandan friend who once said Ugandan weather is the best in the world, I wouldn’t disagree when comparing Kenyan climate to European or my country Vietnam’s). Direct flight from London to Nairobi would take 9 to 10 hours. The distance from Hanoi to Nairobi is almost the same. The high season for wildlife-watching safari is from late June to October, and the peak is July, when thousands/millions of wildebeests cross Mara river in the Maasai Mara national reserve as seen on Discovery Channel. Beside the safaris (Maasai Mara and Lake Nakuru), other popular activities in Kenya include Mount Kenya & Mount Kilimanjaro trekking and some other trekking routes in the wilderness. The official language in Kenya is English. The national language is Swahili, and they have many other local languages. In Kenya, all subjects at school are taught in English and Swahili is a compulsory subject. A Kenyan friend said that they used Swahili to unify East Africa, however, Kenyans speak Swahili not as good as Tanzanians; and I also know that in Uganda, Luganda is the main language, not Swahili. Nevertheless, I learned quite a bit of Swahili after my 2 weeks, and I found that the language was not very complicated. Kenyan food has quite some tastes of Indian with the popularity of pilau and chapati, and generally not vegetarian-friendly. African tastes are found in all kind of pea and veg stew; the Ugandan matoke (cooked green bananas) or ugali (maize flour porridge) are popular here as well. Kenyan people are very friendly, they love to talk to tourists, and they’ll make sure you’ll never be left alone. Solo women may trigger lots of attention from local boys, just like in India or Morocco; therefore, do try to stay away from troubles ladies! Touts are common, just like in most countries. People might approach you randomly, act very friendly and offer to take you around to eventually ask for money. I wouldn’t disagree with that, it’s great to have local people taking you around sometimes and show you best places to eat or stay, just agree on the price beforehand to avoid discomfort later on. Please don’t be harsh on them, they are actually very nice. Honestly speaking, I always dislike angry tourists/expats/foreigners/(whatever) who think everyone is trying to rip them off and behave impolitely to local people by raising their voice or bargaining down to a single penny. The currency is Kenyan Shilling. 1 GBP ~ 130 KES and 1 USD ~ 100 KES (as of September 2016). Wifi is rare, it’s better to get a 3G simcard. I bought an Airtel simcard in the local market in Nairobi. 3G in Kenya is generally cheap, just like in Vietnam. For inter-city travels, use Coast Bus. It’s the best bus company in the country and the price is not more expensive than others. For inner city transportation, use tuk tuk or matatu (this one is local public bus, super squeezed, but it costs you a fixed fare of only 50-100 Kes for each drive). Even though safari was not the initial purpose of my trip, eventually that still is what everyone does when in Kenya and I can’t be out of the loop. 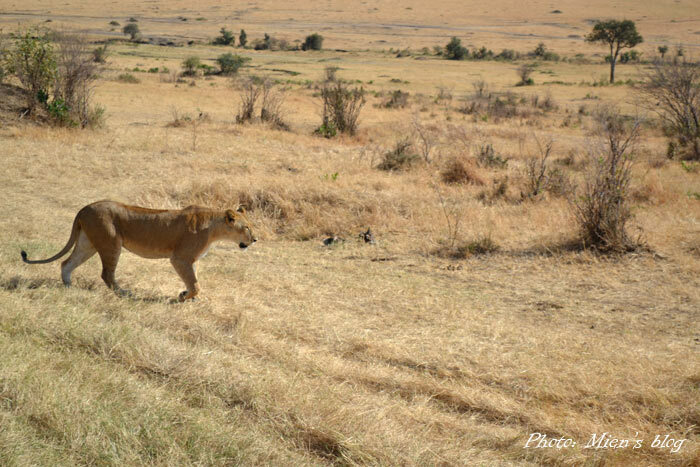 Wild animal watching is the most popular tourist activity in Kenya. I took the tour with Right Adventure Safaris and totally recommend them. I got a 3-day 2-night Maasai Mara tour for £280 ($360) and was offered a free Nairobi walking tour by the tour seller, Moses. He’s a very nice and trustworthy guy, you can contact him via info@righttimessafaris.com. If you want the 4-day 3-night Maasai Mara & Lake Nakuru (for the flamingos & birds) it’s £80 more. One quick note that Maasai Mara reserve is very touristy, there will be more tourist vans than the wild animals, and it appeared that the animals were so accustomed to the tourists that they didn’t care about our appearance anymore. 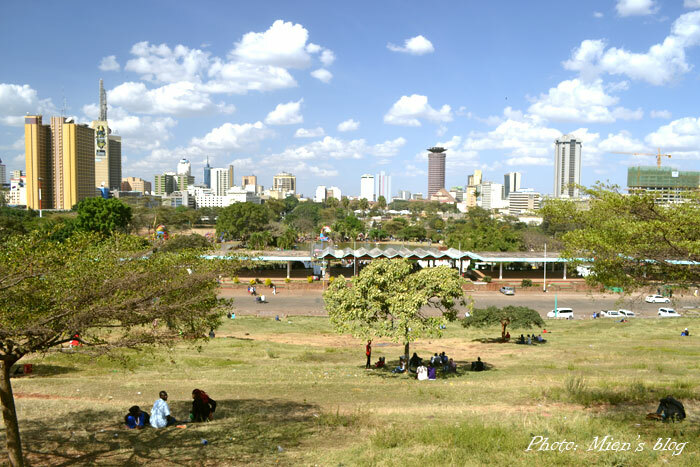 Nairobi, the capital and largest city of Kenya, is the major business and culture hub in East Africa. The popular tourist destinations in the city include David Sheldrick Wildlife Trust (or Elephant Orphanage), the Giraffe Center, Nairobi National Park and Karura Forest. My feelings about Nairobi are very mixed. I had the chance to see two opposite faces of the city: the rowdy city center which looks to me like a smaller version of Old Delhi where I could eat 30 Kes meal ($0.3), and the posh residential & shopping area where a simple African mixed veg stew cost 700 Kes ($7). Nairobi seems to me just a transportation hub for tourists to go on adventure and trekking tours and safaris. For some reasons, I didn’t like Nairobi as much as I had expected. I spent quite some time here though, about 6 days. I stayed at a basic hostel recommended to me by my Japanese safari mates called New Kenya Lodge for 750 Kes/bed/night. It’s super basic and not the cleanest place in the world, but the managers are friendly, the location is very central and there is wifi ;-). The hostel is full of Japanese backpackers, probably because it is featured in Japanese travel guide books. During my last days in Nairobi, I stayed at my friend’s, a Filipino musician, with his Finnish wife and their lovely twin boys. I got to attend a hip-hop night at a super cool outdoor bar called The Alchemist and the Jazz & Roots music festival at The Elephant and met with some interesting local bloggers and musicians. This local night life was far different from my backpacking experience in the crowded city center. That’s why it’s always more fun having local friends show you around; and if your friend is a musician & producer who knows what’s on in the city, it’s even cooler! I was also introduced to UP Nairobi, an expat’s lifestyle magazine (similar to Vietnam’s Word Magazine), and the art & culture event blog Nairobi Now, which very much resembles the early stage of my own Hanoi Grapevine. Karura Forest – it’s amazing how they have an actual forest amidst the city. Love it! Mombasa is a lovely beach city. The first glance reminds me so much of Mumbai in India with the beaches, the auto rickshaws (tuk tuk) running up and down, and the cool ocean breezes, though Mombasa is way less crowded and far more peaceful. The city takes Kenyan Hakuna Matata to a whole new level. The local motto here is Pole Pole, which means ‘slow slow’, and it’s the best description for the place. Life here is so slow, so relaxing that can easily make people forget about time. – Near Nyali Beach: Tulia House Backpackers. I stayed here in the dorm room for 2 nights. It’s a quite fancy hostel, only 5 minute walk from the beach. Nyali Beach is the resort part of Mombasa, I got bored quickly, plus mosquitos bit me like crazy. – Inside the old town: Royal Palace Hotel. Don’t let its name deceive you. It’s not expensive at all. I found it too late so couldn’t test the quality but would think it’s a nice little cozy place to stay, and it is conveniently located right inside the lovely old town, too. Two weeks in Kenya can be quite long for a casual tourist as there seems not to be many places to go, but for someone who is looking for an inspiration to stay, it’s not enough. For some reasons, I wasn’t fully engaged in life over there. I actually saw a lot of opportunities for a creative peep like me to thrive in both Nairobi and Mombasa. Kenyan life is also simpler and the streets here are way less crowded compared to the bustling cities I have lived in (Hanoi, Ho Chi Minh City, New Delhi and London), but I feels like there’s something missing. I don’t know what it is, especially when considering that I have been dreaming about Kenya for a long time. Probably I need a second visit, and next time it will be a full East Africa exploration, that says Uganda and Tanzania, do expect me at your door some time soon. This entry was posted in Abroad Travels, Vietnam and tagged Backpacking, Kenya, Photo, Pictures, Solo girl travel.